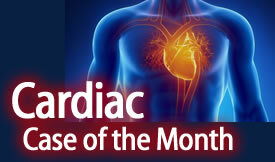 The Education Committee of the STR is pleased to present the case of the month in Thoracic and Cardiac Imaging. These cases are submitted by STR members to highlight a specific diagnosis and the differential diagnosis to which it belongs. Each case follows a bulleted approach to allow for a quick review. Simply click on the links. The archived cases can be viewed in one of three ways: randomly by date; randomly by diagnostic group based on the ABR study guide topic, or by diagnosis based on the ABR study guide. We hope you find these cases educational. Please utilized the following STR Case of the Month template to submit a case. Andrew J. Bradley, et. al.